Is Ford Bringing an Actual Small Truck Back to the U.S.? Compact pickup trucks, lawsuits over tiny fish, unexpected dangers on the road and more await you in The Morning Shift for Wednesday, Aug. 1, 2018. A new compact Ford unibody pickup truck is in the works with plans to bring it to the U.S. market in 2022—at least, according to sources familiar with the matter. Those sources spoke to Automobile recently, saying that the truck would be built on the next-generation Focus platform. With Ford throwing most of its cars out the window here in the North American market because everybody wants trucks, SUVs and crossovers, it makes sense to build yet another size variation of a truck. Sources told Automobile the reported new smaller truck would slot in below the new Ford Ranger, which has gotten pretty large itself. Ford is preparing a compact pickup truck that would fill the space left open when its Brazilian-built, Fiesta-based subcompact Courier pickup was replaced with the larger, midsized Ranger in 2013. 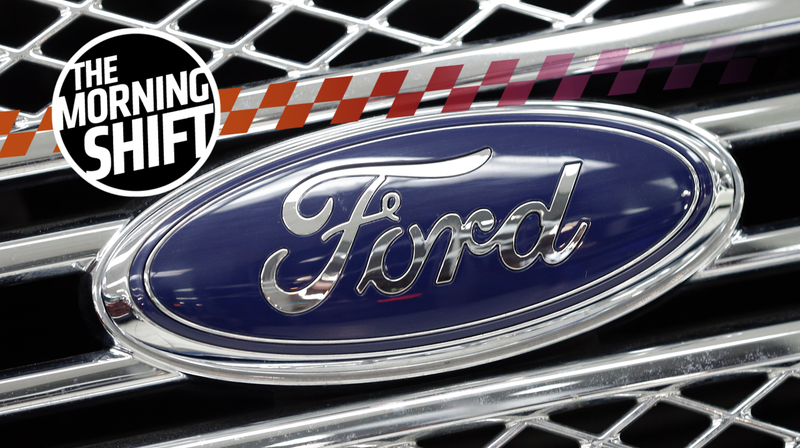 Sources familiar with Ford’s future product plan say the automaker is considering it for the U.S. market. It would slot below the Ford Ranger midsize pickup arriving in U.S. dealerships early next year, but bigger than the 1998-2013 Courier. The European Union market has been buying larger vehicles in recent years, including pickup trucks, and so the Courier replacement will be built on the next-generation Focus platform, sources say. Really, it would be nice to have another Focus RS instead of a new Focus-based pickup. But trucks, crossovers and SUVs—that’s all automakers see when they look at us now, and it’s all our fault. The $1.6-billion plant Mazda and Toyota decided to build together was all fun and interstate jealousy until a location was announced, because the companies picked a spot where they could potentially harm a tiny, threatened fish species. Now, they may get sued over it. The story started way before either company decided to build a factory capable of 300,000 cars each year in Huntsville, Alabama when it opens in a few years, and a group called the Center for Biological Diversity kept Toyota and Mazda out of it at first. It instead sued the U.S. Fish and Wildlife Service for allegedly not abiding by the Endangered Species Act in regards to the spring pygmy sunfish—our little friend that could be affected by this new car plant. The formal intent to sue is here, and more background on why the fish, the plant, and the main arguments from the center can be found here and here. Tesla’s prices are skyrocketing in China thanks to international trade wars and tariffs galore, and Bloomberg reports that the company could change that with the help of a $5-billion investment into a Chinese factory that’s partially funded by partners in China. Plans are for the plant to be near Shanghai and Tesla’s considering getting funding from local partners for it, according to Bloomberg. Chief Executive Officer Elon Musk secured a preliminary deal to build the factory last month, just days after China’s retaliation against President Donald Trump’s tariff hikes boosted the cost of exporting cars made in the U.S.
Chinese funding partners could enable Tesla — which is yet to turn a profit — to share the financial burden of realizing an ambitious expansion plan that includes building a factory in Europe. While analysts say the California-based company will need to raise capital to bring its plans to fruition, so far Tesla has insisted it doesn’t need to do so. The carmaker had just $2.7 billion in cash at the end of the first quarter, and has been spending billions of dollars on accelerating production of its Model 3 sedan. China imposed tariffs on U.S.-made cars in response to the mounting trade war, increasing the prices of the Model S and Model X by more than $20,000 each in the country at the beginning of July. Prices as a result of the trade antics are pretty unpredictable, too. Tesla didn’t provide details on how much the factory would cost when it announced the preliminary agreement with the Shanghai government last month. The source who spoke to Bloomberg said Tesla wants to start producing the Model 3 in the Chinese factory by 2020. When General Motors sold Opel, it was because the German brand was bleeding money year after year, with no end in sight. But now, under its new French ownership of PSA, Opel is actually doing well, with Automotive News Europe writing that the brand scored a first-half operating profit of $587 million and managed a 5-percent profit margin. The biggest area of savings came from manufacturing. Opel has “compressed” assembly plants to make them more compact to save in areas such as logistics and has reduced complexity, [Opel CEO Michael] Lohscheller said. PSA is also reducing its employee count by 3,700, according to Automotive News Europe, with PSA CEO Carlos Tavares insisting that the cuts will be voluntary. Lohscheller said top management has been cut by 25 percent. But PSA’s recent success wasn’t just about reducing manufacturing or labor costs. Strategic changes in pricing and “model mix” for the brand’s new SUVs were also key. Lohscheller says variable costs per model are down, and that the brand’s strong performance could continue. Aug. 2 is the most deadly day of the year in terms of traffic crashes in the U.S., in case you woke up this morning and thought, “Gee, I wonder what the most deadly day for U.S. driving is?” So, yeah, maybe stay home tomorrow. That count is according to Insurance Institute for Highway Safety, or the people who do the IIHS safety ratings on your car. According to IIHS stats published by Bloomberg, the danger of Aug. 2 isn’t because of anything particular like drunk driving, bad weather, big sporting events or holidays. It’s just because it’s sunny and nice outside, and a lot of people are traveling on vacation. The month of August in general is bad for that same reason, Bloomberg quoted IIHS researcher Becca Weast as saying. People are less on guard while driving because the weather is good, and there are just a lot of them out there. Between 2012 and 2016, the five most fatal days to be on U.S. roads were Aug. 2, with 101 average deaths each year; July 4, with 99 average deaths, Oct. 25, with 98; and May 3 and Nov. 1, each with 97 average deaths per year. It’s a good week—month, year, all the time—to work from home. Richard Petty became the first NASCAR driver to surpass $1 million in career earnings on Aug. 1, 1971 with a win in the Dixie 500 in Georgia, according to the NASCAR website. That’s a lot of cash. Neutral: Do ‘Dangerous Days on the Road’ Freak You Out? Driving on New Year’s Eve or the early hours of New Year’s Day? Nope. No, thank you.